This genuine 1-liter Bota Bag is basically a leather canteen for your wine. Take it hiking or camping and to concerts and festivals! 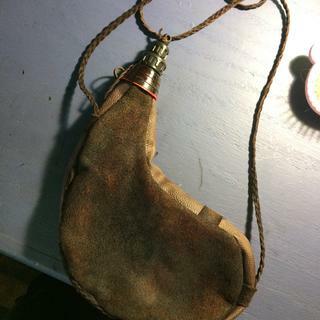 A Bota Bag, also known as a wineskin, is a soft canteen designed to carry liquids, especially wine, in the great outdoors and across long distances. They have been used by various cultures and civilizations for centuries and have an especially long history in Spain. Traditional Bota bags were made from leather, and this handsome, modern adaption is no exception. But unlike old fashioned models, which were lined with goat bladders, this Bota bag relies on a food-grade latex interior to keep things watertight. 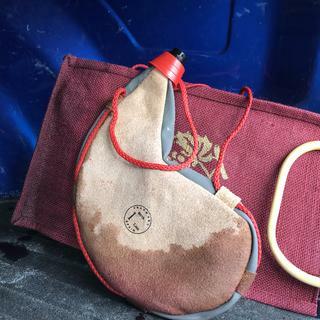 Use your Bota Bog to carry up to 1 liter of wine, water, or any liquid of your choosing to parks, concerts, festivals, the beach, hiking, on a boat, or camping. It's lighter than cans and bottles and comes with a red braided shoulder strap that makes it easy to take with your wherever you go. When the bag empty, it packs flat for easy storage. What's more, this Leather Bota Bag features a plastic nozzle to easily share its intoxicating contents without putting your mouth on the opening. Simply drink from the stream of wine that pours from the nozzle and pass it along! so many uses for this. Durable. Compact. Just plain fun. Very well made, lovely bag thank you. Holds almost an entire bottle of wine! I bought for the Ren fair and saw 3 other people with it. I wish there was more variety in color. Price was amazing. I stained mine to look more authentic. Read other suppliers customers comments about leaks and smell. I checked mine as soon as it arrived and no problem with it sealing and any residual tastes as minor as they are I am sure will go aways after rinsing them out a few times. I have had two of these from many years back that I used consistently on the ski slopes every year and they went through a lot for more than 15 years, don't see why these wouldn't last just as long. I am now ready for winter!!! I use this to carry water when I walk my dog. It's perfect! Would recommend to my friends. First time to use it and it had a pin hole in the bottom somewhere. Leaked all the wine out . I'm so sorry to hear that the bota bag you received was defective and leaked. A customer care representative will reach out to you directly to arrange a refund or replacement. I apologize for the mess and inconvenience. We'll be in touch soon. Going to Alaska for the Iditarod - giving one to each couple while out in the elements for our whiskey! I am checking the quality if this bag. Our clients are going to Spain this summer and we thought this would be a great gift for them! It is for a gift that someone has been looking for! Glad you have it! Thank you! It's for a friend's birthday. He likes his wine and Jack Daniels. Go for on the go. To avoid carrying a water bottle on walks. Low price and low shipping costs. Convenient way to carry water, and the spout makes it possible to share without lips touching the same surface. Had one years ago and somebody needed it more than me. It's time I got another on because lm tired of needing it and don't have. had one many years ago. planning a bike ride. Reminded me of one I had as a kid. Will be a xmas present for my daughter who loves her wine!!! Perfect gift!! Great for biking, wheeling, sledding, kayaking, whatever!! Perfect for my Ren Faire costume! My son mentioned he'd like to have one. I saw it on Bizzare Foods /Andrew Zimmern. My wife and Aunt would LOVE this!!! I was in the market for 1 of these. I jumped online and this was the best price. For a gift. It's a classic piece. Can you put whiskey in it safely? BEST ANSWER: I used it for wine and never tried whiskey. I believe any liquid...even water could be put into it. I don't know why not. We've put vodka in it and had no problem. Yes! You can put wine, water or spirits in a bota bag. Cheers! Would think so but have only used it for wine. Where do you guys buy the mouthpieces? BEST ANSWER: Are you serious? There's no freaking mouth piece! This is the way it's supposed to be. Easy drinking! we did not purchase additional mouthpieces. We just use the one it comes with. A standard bottle of wine will fit in this? BEST ANSWER: Yes, it will! The Bota Bag holds 1 liter of wine (or water). Is thy lining BPA free? BEST ANSWER: The bota bag weighs just under .5lbs empty. BEST ANSWER: Our bota bag is not lined with goat bladder like a traditional Spanish bota bag. It is made with a food-grade latex lining. Cheers!